One of the central and most interesting areas in the political party research agenda is the exploration of which positions parties take on single policy issues, policy fields and general ideological scales like the left-right continuum. Knowing these positions is the basis for assessing what parties stand for, whether they do what they stand for and, indeed, whether they stand for what citizens want them to do. While politically informed citizens and individual political scientists might have a good idea which positions certain parties have, these evaluation are not necessarily purely based on what the party actually communicates but are also influenced by factors such as an individual’s personal belief and the presentation of the party in the media. The Manifesto Project is the longest standing and most comprehensive effort to measure party positions in a rigorous and objective way. This means that the data are not based on an individual’s assessments of a party’s position but instead on the most formalized and comprehensive policy document which parties release: electoral manifestos (also called electoral programs or platforms). Specially trained coders read these documents, parse them into single policy statements and then attribute each statement to one of 56 pre-defined policy categories. These categories cover a wide range of policy issues from foreign policy, economic policies to welfare and education. For each manifesto, we then count the number of statements overall and for each category and, finally, calculate how much space parties give to different issues within their manifesto. For example, a value of 50 for “Welfare State: Positive” means that 50% of all statements in this manifesto concern this issue. Currently, the project has collected data from 3611 manifestos produced by 905 parties who have run in 623 elections in 55 countries (OECD and EU as well as Central and Eastern Europe). The first step in analyzing this data is always to simply look to the actual content of the manifestos: Which parties stand for the extension or for the reduction of the welfare state? Which parties want a totally free market and which parties want the state to control (parts of) the economy? Which parties want to help immigrants to integrate and which want to force immigrants to assimilate? The list of possible questions is broad. Apart from these policy specific questions, however, we can also compare parties on the left-right scale. For this reason, the Manifesto Project Data set includes a standardized left-right position (called RILE) for each manifesto. RILE is created by first adding up the relative shares of 13 right and 13 left categories – including socio-economic as well as social value policies – and then subtracting the sum of the left categories from the sum of the first. RILE then runs from -100 (extreme left) to 100 (extreme right). 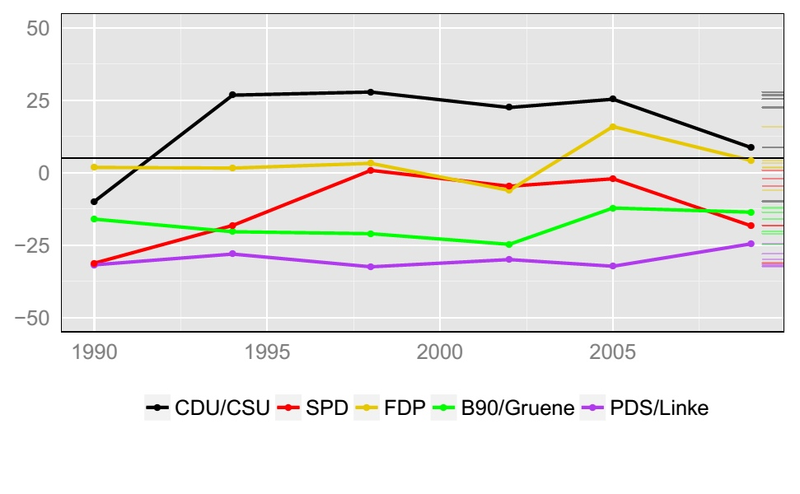 The following Figure shows how the left-right positions of the five parties in the German Bundestag have developed since reunification. The manifestos of the 2013 election have just been coded and can be found here. Dieser Eintrag wurde veröffentlicht in English posts, Forschungprojekte, Manifesto Project von Pola Lehmann, Nicolas Merz, Sven Regel, Annika Werner. Permanenter Link des Eintrags.